In cinemas this week: Fury, Whiplash, This is Where I Leave You, Hector and the Search For Happiness, Living Is Easy (With Eyes Closed) and Decoding Annie Parker. Fury - April, 1945. As the Allies make their final push in the European Theatre, a battle-hardened army sergeant named Wardaddy (Brad Pitt) commands a Sherman tank and her five-man crew on a deadly mission behind enemy lines. Outnumbered and outgunned, and with a rookie soldier thrust into their platoon, Wardaddy and his men face overwhelming odds in their heroic attempts to strike at the heart of Nazi Germany. Whiplash - Andrew Neyman is an ambitious young jazz drummer, single-minded in his pursuit to rise to the top of his elite east coast music conservatory. Plagued by the failed writing career of his father, Andrew hungers day and night to become one of the greats. Terence Fletcher, an instructor equally known for his teaching talents as for his terrifying methods, leads the top jazz ensemble in the school. Fletcher discovers Andrew and transfers the aspiring drummer into his band, forever changing the young man's life. Andrew's passion to achieve perfection quickly spirals into obsession, as his ruthless teacher continues to push him to the brink of both his ability and his sanity. This is Where I Leave You - When their father passes away, four grown siblings are forced to return to their childhood home and live under the same roof together for a week, along with their over-sharing mother and an assortment of spouses, exes and might-have-beens. Directed by Shawn Levy and self-adapted by Jonathan Tropper from his own best-selling novel. Hector and the Search for Happiness - Hector (Simon Pegg) is a quirky psychiatrist who has become increasingly tired of his humdrum life. As he tells his girlfriend, Clara (Rosamund Pike), he feels like a fraud: he hasn't really tasted life, and yet he's offering advice to patients who are just not getting any happier. So Hector decides to break out of his deluded and routine driven life. Armed with buckets of courage and child-like curiosity, he embarks on a global quest in hopes of uncovering the elusive secret formula for true happiness. And so begins a larger than life adventure with riotously funny results. Based on the world-wide best-selling novel of the same name. Toni Collette, Stellan Skarsgard, Jean Reno and Christopher Plummer co-star. Living is Easy (With Eyes Closed) - It is 1966 in Albacete, Spain. English teacher and die-hard Beatles fan Antonio decides to go on a road trip to Almería in the hope of meeting John Lennon, who is shooting a film there. On the way he picks up two hitch-hikers, Juanjo and Belén. This unlikely trio form a bond and decide to follow their dreams in hopes of finding their freedom. Decoding Annie Parker - Based on true events, Decoding Annie Parker tells the life affirming story of two remarkable women; the irrepressible Annie Parker, a three time cancer survivor and the geneticist Mary-Claire King whose discovery of the breast cancer BRCA gene mutation is considered one of the most important discoveries of the 20th century. 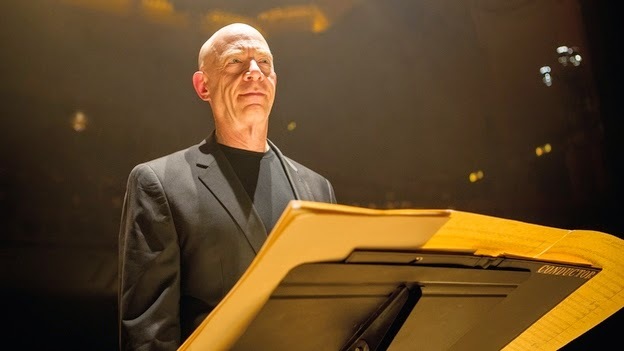 Weekly Recommendation: Whiplash may have settled to leave me with a troubling feeling in the pit of my stomach, but its technical achievements are notable and the performances by Miles Teller and J.K Simmons are outstanding. How far would you be willing to go to achieve perfection? It is something everyone strives for in their life at some point. This is the story of two men (a terrifying teacher-pupil bond) driven by their entangled obsessions. Fury is another film with lofty ambitions that doesn't quite get it all right. The authenticity of the brutal combat sequences, and the immense work that has gone into their construction and the recreation of the period, is undoubtedly impressive. It also features an incredible score by Steven Price (Gravity) and Logan Lerman's performance is a stand out. But, the film's forced core camaraderie, which I felt was essential to its success, felt off. I have been looking forward to This is Where I Leave You for a while now, but reports have been less than positive. I had not even heard of Living is Easy until this week, but as it is Spain's foreign language entry at the upcoming Oscars it should be worth a look.